Rudolph Valentino stars in the 1921 silent classic. The New Palace Theatre Organ Heritage Centre is based around its multi-purpose Auditorium, which is equipped to a professional standard with audio, video and stage lighting systems. The Auditorium is suitable for a variety of uses, from rehearsal room to atmospheric function room, as well as uses for Cinema, Lecture Theatre, Conference or Seminar, Dance venue, and live music and performance venue, and the excellent acoustics are particularly suitable for chamber music. Housing the Unique HiLSDON Unit Orchestral Pipe Organ and an exhibition of memorabilia from the Golden Days of the Cinema, it makes a charming and interesting, multi-functional intimate public space. Apart from public events, the Auditorium and adjacent Green Room are available for private hire for any type of event suitable for attendees from 6 to 75. We have hosted a wide range of private events including birthday parties for all ages, formal receptions including a Civil Partnership, and works outings, to name but a few. Owned by the Scottish Theatre Organ Preservation Society (STOPS), a registered Scottish Charity (SC018217) the Society each year presents a number of theatre organ concerts as well as classic silent films accompanied live by the theatre organ. 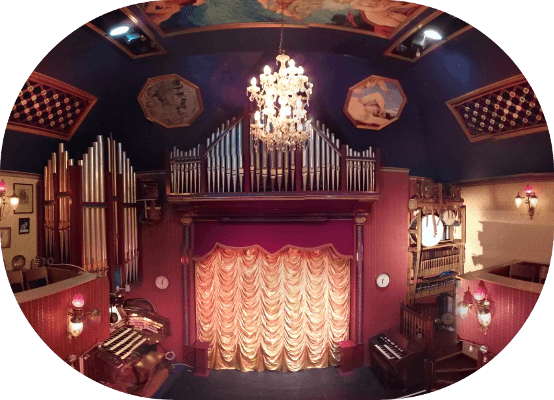 Please see our sister website which gives the history and details of STOPS - www.stops.org and the history of the Unique HiLSDON Unit Orchestral Pipe Organ, the majority of which came from the Playhouse, Edinburgh. Without this particular instrument, the Playhouse in Edinburgh would be just a distant memory and the Centre itself would not exist. The Centre also welcomes visits by groups of interested parties for an afternoon or evening of musical entertainment, when our Resident Organist reminisces about his days playing the last organs in the cinemas of Edinburgh. For these events, we provide catering, from tea and biscuits, to a sumptuous high tea or finger buffet. Please refer to the Menu Item above about Group Visits for details. Except for the small balcony, the Centre is fully accessible for wheelchairs and those with limited mobility. An Induction Loop for the hard of hearing is at the Servery Counter. Toilets, including an accessible toilet with hand rails, are also provided. The Centre is also home to the Independent Weather Station which provides the data for Greenlaw to www.bordersweather.co.uk which website was initially conceived to give travellers to the Centre an idea of what weather to expect during their visit, but which has grown and is now a respected member of a nationwide chain of independent weather stations.